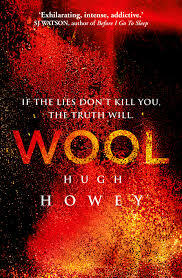 Wool by Hugh Howey is a suspenseful and adventurous tale about Jules, a mechanic who cares greatly about her job. The story takes place in a silo. However, this is not your ordinary silo; this one is 144 stories and beneath the earth. This silo was built as a bunker for important people in the U.S. government. However, everyone’s memory was erased so they could not remember what happened. It is also split into sections, with farmers and mechanics in the lower third, IT or information technology workers in the center, and the professional class in the upper third. They have all of the essentials to live: food, water, oxygen, electricity, and a job to earn money. You might ask why they haven’t tried to break out yet. Well, the outside is not as pleasant. Everyone who has ever been sent out died from the toxic air and their bodies are seen rotting away by the silo’s one and only camera. Sometimes the camera acquires dust from dust storms, which occur often. After, someone has to be sent out to clean with wool. Everyone who has been sent out to clean has cleaned the camera before succumbing to the toxic air, except Jules. Jules was selected to be the next sheriff because the last one, Holston, voluntarily went to cleaning and died. When Jules finally got up the grand staircase to the top floor where the sheriff lives, she started looking into Holston’s death and why he would want to go to the outside. The details she uncovered were surprising and disturbing. However, before she could take action to alert her friends, the other sheriffs arrested her and sent her to cleaning. Jules did not clean the camera. Instead, she explored over the hills. This started a rebellion against IT, resulting in one of the major conflicts of the novel. Hugh Howey’s Wool takes the reader through Jules’s journey of mysterious deaths of her friends, solving past cleanings, and the connection between IT and the start of the silo. Wool is a good book for anyone who likes mystery, adventure, post-apocalyptic, and dystopian books. I really enjoyed this book because the characters were realistic and very descriptive. There was also a lot of suspense that kept me on my toes, every time I opened the book. I would recommend this book to anyone at or over the age of 12 because there was some mature content. Overall, Hugh Howey’s Wool is a great book and I am looking forward to reading the next books in the series, Shift and Dust.